Making history at Les Deux Magots: Sandrine De Sousa Costa, the café's first female "garçon"
"You're making history!" 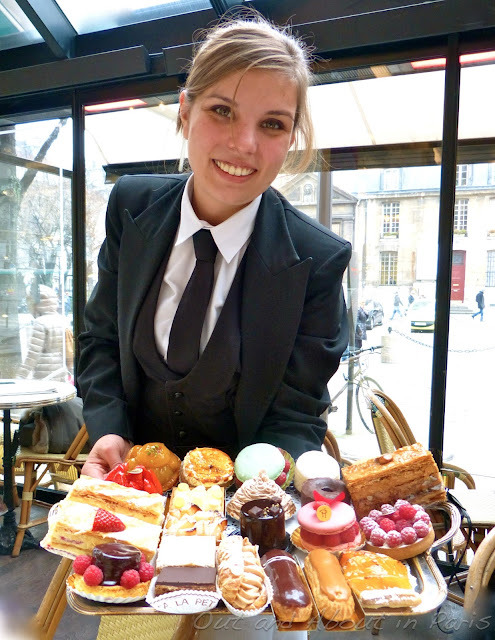 That's what longtime customers of Les Deux Magots frequently tell Sandrine De Sousa Costa, the first female "garçon" to work at the world famous cafe located on the bustling boulevard Saint Germaine. 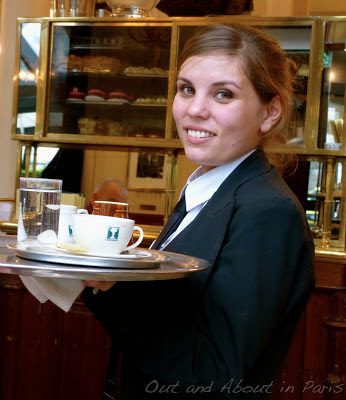 Indeed, the idea of a woman entering into what has long been considered an exclusively male domain was so progressive that the director of Les Deux Magots, who had already worked with Sandrine at another establishment, asked the waiters if they would agree to have the 23 year old join their ranks prior to hiring her. Held under close scrutiny by both her colleagues and the regular clients of Les Deux Magots, many of whom dine at the cafe on a daily basis, Sandrine was pleased when they declared that she "works like a man". In fact, even though it was difficult to find a uniform that would fit her petite size when she started working at Les Deux Magots last April, the only discernible difference between Sandrine and the other "garçons" is that her long hair is swept into chignon and she wears a black tie rather than a bow tie. Knowing that most visitors to Paris have an opinion about French waiters, I asked Sandrine what she likes and doesn't like about serving tourists. In between deftly delivering steaming cups of coffee to a table full of Parisians and taking the order of the German woman seated next to me, Sandrine didn't need any time at all for reflection before answering, "I like it when tourists are zen, or relaxed...when I can see that they're happy to be on vacation. 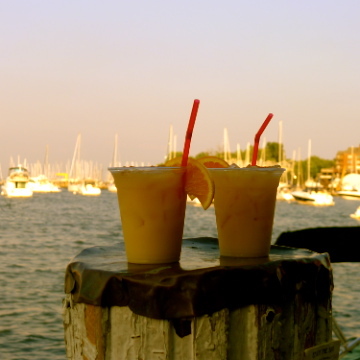 Sometimes they'll ask me about the history of the cafe or a question about Paris." After returning from a trip to the kitchen to place an order, she added, "I don't like it when people are impatient and expect me to serve them the minute they sit down. It's not always possible, especially when we're very busy." Sandrine, the daughter of Portuguese immigrants, started working in her family's restaurant in a western suburb of Paris at the age of 14. From there, she polished her skills at La Coupole before moving to Chez Francis, a chic brasserie with a view of the Eiffel Tower. Accustomed to working long hours, Sandrine hopes to one day open her own restaurant, perhaps with her father now that the family restaurant has closed. In the meantime, she feels very fortunate to have a position at Les Deux Magots. Not only is she their first female garçon, but she's also the only woman to work at any of the mythical cafes and brasseries (Café de Flore, Brasserie Lipp and Le Bonaparte) in the neighborhood. I want that pastry tray. Seriously, no (other) women at any of those places? I guess they're off my list of places to frequent. I saw a programme a while ago , saying that these waiters have to train for along time to get a position. History or not as long as someone does a good job of serving the public .. then that is what counts. But already there is a difference a tie instead of bow tie .. .. (not a big deal I suppose) . This is fantastic! She gets so much credit for being so brace to work amongst all those men! Although the comment, "she works like a man," is a bit annoying. It's interesting because when you go to those places there clearly aren't any women waiters and I always wondered if it was because women weren't allowed to work there or just because of tradition have never thought about it. I hope that she fulfills her dream and opens a restaurant some day! Yes, I agree about the annoying comment. I would bet she is actually better than the men! Well, La Coupole is a pretty storied cafe too. Honestly, I had never thought about it, as many other French cafes have female waiters, the absence of them here had never struck me. I wonder though, what is the female form for "garcons"--is there one? Fille? Garconnette? what a beautiful name! Sandrine De Sousa Costa. Like Gwan I am shocked to learn that these establishments don't have women waiters. My trades union and feminist hackles rose. ... not that I frequent them that often for a boycott to make a difference LOL! Very interesting post. Good luck to Sandrine, I hope she gets her own restaurant too. Looks like the dam has been breached, though, ha ha! This is an interesting post - happy to see a female garcon at Les Deux Magots - she is such a lovely young woman - I just returned from Paris and while at the Four Seasons George V Hotel, I noticed that they had not one but TWO female DoorPersons!! That's quite a major step and I talked to both of them and congratulated them on securing that formerly all male position in most of the big hotels! Warmed my heart to see them and one lady kindly allowed me to take her picture (I would have liked to have had both of them in the photo but the other lady had stepped away for a moment) - I could see her pride in having this position in the lovely smile on her face! I liked the bit where you asked her what the waiting staff think of the tourists. We hardly ever get to hear that side of the story! Great post Mary Kay. I find it interesting that cafe regulars praised her for "...working like a man" Some may not see that as a compliment I think!